Play should be a part of your rabbit’s life, as an addition to exercise and social interaction. Toys provide an outlet for natural behaviors and play gives a sense of accomplishment and intellectual stimulation. Toys help protect your valuable belongings by providing acceptable outlets for chewing, digging, burrowing and shredding. Providing toys is providing emotional and intellectual enrichment. Toys do not have to be expensive or fancy (although some are). Homemade toys can be a huge hit too. Some homemade options include phone books, cardboard boxes, a straw broom, oven-dried pine cones, or a cardboard paper towel roll stuffed with hay. Try a digging box filled with paper, play sand or hay. Try a cardboard tunnel or willow tent. Offer a yard of fleece for pushing and digging. Plastic baby toss toys and stacking cups are beloved by rabbits. Emotional, intellectual and social dimensions can have a great impact on wellness versus purely physical dimensions. Rabbit health can decline from emotional impoverishment. Offer new toys on a monthly basis and rotate toys regularly. Rabbits have a sense of humor and will exceed people’s expectations when given the opportunity to do so! 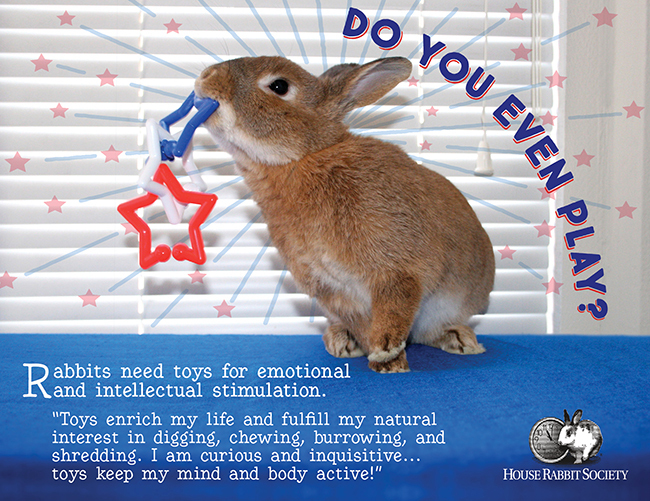 What Kinds of Toys do Rabbits Like? What Are Rabbits Really Like?